Even if it’s supposed to be my night. – came home after night shift. Tried to sleep. Failed. I’ve never been a good daytime sleeper, my body prefers the light to be awake with. – had to go back to pharmacy because they didn’t have concerta 27 last time. – couldn’t find anything palatable to eat at supermarket, settled for a muffin for lunch (ate half) and some wintery microwave meal for dinner as I now have to sleep in the evening, so won’t be able to cook something nourishing. Forgot what else I needed. -couldn’t find a simple yet efficient body cream within a reasonable price (I hate Dove and Nivea with a passion) at the local drug store. Ironically the expensive ones are fancy and inefficient. Settled for something that looks like it should be prescription only, hoping its cruelty free. – No, none of my parcels have arrived. I want them; please! – I got in a text fight with my sister over matters mentioned in previous post. – The shower head has become impotent. It looks like it dates from the ’70’s, and now it can’t stay erect long enough to do its business, leading to water being aimed sideways in the direction that would cause most flooding, and least water to land on the desires area; aka me. I’ve diagnosed it with metal tiredness and it needs to be replaced. I haven’t figured out how to replace it without replacing the tap, as the hose on modern shower heads are wider than they were in the ’70’s. To make things worse, I busted the whole thing by pushing it against the wall when it wouldn’t stay up long enough for me to use both hands to quickly apply shower gel to my loofah. It is now leaking everywhere it can. – Of course, just as I wanted to go to bed, lady upstairs decided to practice playing the trumpet. She’s been at it for months, and sadly she doesn’t seem to be making much progress. – Cherry on top: cramps. In both feet. Yup, I posted this, wading in warm water as that’s the only relief for these cramps in mainly my forefoot. And I was wearing sensible shoes. And well, since it’s 10:45AM that sounds reasonable. Except that it’s night shift time and I have another one to come. I hate nights. I may have drifted off for a few minutes, but I have no idea why I can’t sleep. Maybe Concerta? But I never have trouble sleeping with it. So meanwhile my poor body, not having known when she is for weeks, is even more out of whack. And I don’t know what to do now. Get up, get going or try again? I am just so tired. And because I am tired I am easily worked up. This time because I have to figure out stuff for my cousin and a friend of hers, while my sisters are being very annoying and trying to push me in the role of the boring nerdy elder sister, mum immediately thinks it is a good idea. My sisters want to take them to parties, take them shopping and take them to the same annoying market where you can buy the same crappy quality cheap stuff, lacking style, where they want to take everyone who comes here. Oh, and would I like I show them the touristy stuff then, such as windmills and the parliament? The only reasons they get to have the fun party girl image is because they always got what they wanted at my expense (2 against 1, they’re twins), the fact that they’re identical twins and the fact that I never had the opportunity to make fun friends when it mattered because I was cross-eyed, wore horrible glasses (and an embarrassingly wrong coat, for example; no cash for a new one) and then got grounded whenever I did get invited out. Oh, and I had no self esteem because I had nothing to base it on, being the underdog even in my own family. So, yes, I am angry about that. Especially since I am the one who has most in common with these girls, but, the twins always are the ‘popular’ ones. And the twins have the most organising capabilities and have been living here for longer so they should know the place better, if we’re talking about touristy stuff. Also, it would be cool if they’d take into account the fact that I don’t have a vacation, and work irregular shifts, instead of using the opportunity to make me look like a whining little princess. Seriously, some support would be amazing. Anyway. What I hate most about nights is the fact that I lose 3 whole days to do 2 nights and I am stuck here, of no use to myself and others, and basically isolated. I mean, doing nights basically means I might as well not even be alive for those days as I get no living done and am too tired to enjoy anything. And I hate that, because I’ve wasted too much of my life being zoned out and isolated due to childhood crap. I missed out on my high school years, my uni years and now I want to have the best adulthood ever. So when I miss out like this, with nothing in return; it makes me mad. I think I’ll see if I at least can get some stupid errands done, so I needn’t waste precious feel good time on it. And then go to sleep later, I can’t stay here anymore. As the train I am sitting in doesn’t seem to be getting anywhere (what did I expect! I only left on time for everything!) I might as well use the time for some blogging. This weekend was ‘Festivities’ weekend, something between ‘Sinterklaas’ and Christmas, with TDH’s family. I had a great time and am still buzzing from positive interaction. A while ago I was thinking about it. There is this whole misconception about ADHD folks being a certain way. Either bouncy or dreamy, and sometimes EVERYTHING gets attributed to ADHD. But. There is still me. ADHD interacts with different personalities differently. And that’s interesting. And it also means you can never over generalise and say something in the line of ‘ADHD = unhappiness, anxiety or whatever’. Also, what works for one won’t work for another. I have ADHD and I have no clue what real anxiety feels like. For example. Yet, I know ADHD folks who have bad anxiety issues. My downfall is burning myself out from time to time. ADHD and extroversion combined has its own challenges. And benefits. Untreated ADHD left me lonely, while I needed company. I was too much for some people, and with no brake I was either exhausted or a bulldozer. Listening was hard sometimes. I always was easy in getting connected and lousy with staying that way. Of course, it wasn’t JUST ADHD. When I said I have no idea what anxiety feels like, I didn’t say that I knew no relevant feelings. I know the stress of being in an environment where you can get hurt at any given moment all too well. I ‘need’ people around me, I can become depressed due to lack of meaningful connection. That’s not the same as ‘neediness’, like people with some type of personality disorders may display, for example. I can bear being alone for a while. I can cope by myself. Actually, I am a pretty independent person. Still, I don’t thrive when being solo. When channeled a bit, I’m the type of person who can generate energy in a social setting. The ‘when you’re smiling, the whole world smiles with you’ type. Unfortunately, the reverse is also true, my bad mood can influence others too. I’ve learned to focus on positive interaction. I’m not dependent of others to heal my hurt. But, being an extrovert, I want to share. But, I enjoy sharing joy more than I need to share my hurt. Still, I feel those who are close to me should be there for me when I need an ear and an arm, because that DOES help me heal faster. ADHD makes everything more intense. I can be exhausting. I can be too much. I can come across as self centered, while really I am just being intense. I can say really stupid things. Or talk too much. And I need to learn to be more aware of when I am overwhelming, and allow others bask in the sun. Because here is one secret always neglected in the extrovert-introvert discussion (mostly written by introverts on the internet, It Is OK To Be An Introvert): we’re NOT energy vampires. We’re generators, and want EVERYONE to have a good time. Well, I do, at least. And I only bounce harder to try to get you to bounce with me and it makes me happy to see others happy. And my H allows for extra bounce. And for extra problems. ADHD is part of who I am, not all of who I am. Between work, the coming festivities and just being me I’m really really really busy. And very much behind on just about everything! I suppose I start with clearing things up so I know what’s up and what’s down. I feel like I’m not going fast enough, and then try doing everything at once, which of course works even less. Sort out my doctor’s bag which I’ll be needing -oh, haven’t I mentioned I got accepted into GP training?-…. because my dad’s hassling me about it, which is fair enough as he wants to give it to me for Christmas. Yes, I am pretty sure the world has heard it by now. Nelson Rohihlahla Mandela died on December the 5th, Tata finally got to rest. Not another Mandela honouring post, you’d say. If I had time earlier, I would have written earlier. The thing is, I DO get to write about it. December 5th is Sinterklaas evening in Holland. I was busy watching Law and Order and half a movie (recorded the other half), happily avoiding the white old man in a dress with his pitch black helper boy. (Off topic: that puzzled me for years… and now the Dutch are angry because the UN are equally puzzled by this. At some point I figured it must have been black FROM soot… until recently somebody pointed out it’s black LIKE soot… and I shall continue to be puzzled). I was about to go to bed when TDH told me to check the news. I did, I checked the Dutch news as I assumed it would be something about around here. Apparently Madiba had died. I checked the South African news websites, as they at least knew the difference between Nelson Mandela and Morgan Freeman. It was true. As it sunk in, I sung and I prayed, apparently like a proper South-African. What I remembered of the original Zulu version of ‘Nkosi Sikelel’i Afrika’ seemed most appropriate, given the meaning. I am thankful for Madiba, for what he has done for us all. And I pray our people will keep his legacy alive, and show the world what we’re made of rather than fight each other. There have been speculations about the effect of Madiba’s death on the country. Regardless of how far I am from it, and how long I’ve been away from it, it’s still my country with my people in it. And I realised I owe my freedom to Mandela too. Nobody was free under the Apartheid rule, and Madiba also made it very clear that White South-Africans are South-Africans too… Apartheid was going to end, no matter what… Mandela allowed us to be free together with the others. I know, I know, not JUST Mandela. (There were more. He even shared the Nobel prize with F.W. de Klerk). While they were at it, women and the disabled were being empowered too. I grew up in the middle of it. I remember my mum chatting to our domestic worker about Mandela being free. I remember the same air of uncertainty that has been hanging around my childhood in South-Africa in the ’90s. I wasn’t raised with Apartheid ideologies, on the contrary. I witnessed it’s tail, I witnessed what it did. I remember my mum casually chatting with the domestic worker about what was happening, no tension between the two at all. I remember 1994, I was 8 years old. Our primary school teachers had to explain things to us, still trying to make sense of it all themselves. My school was white, my school was Afrikaans. We had a large picture of F.W. de Klerk and the flag hanging in every classroom. I remember my sister, 5, running around in the garden just before the elections, shouting ‘A.N.C.’. I remember not being able to make out what was right and wrong, having heard too many different views. When you’re 8, you want a right and wrong. I remember getting elections day off. They were voting in our school. I could see the queue from our house; it had to be at least 300m long. I remember Nelson Mandela becoming president, and I remember changes. We had Mandela hanging in every classroom now, we had a new flag, look, it stood for unity, and we were high on the concept of a Rainbow Nation. One of the first changes I remember was banning physical punishment in schools, as it directly affected me, of course. I remember 1997 Environment day, my very white school and two very black schools decided to play together that day. Kids being kids, there wasn’t very much inter-school mingling. It WAS weird, because these kids seemed different from us and visa versa. We had been taught they were different for years. I was one of few who actually thought the intermingling was fun. I remember sharing food with two girls from one of the other schools. And 1995 rugby world cup. I remember listing Mandela as one of my heroes when I was 16. I hadn’t read ‘A long walk’ then, I just was old enough to understand. And I did believe, and still believe, that Madiba had the Lord on his side. I know he was a Christian. I was old enough to look back, and realise what he’d done and what he stood for. Our wise old man, who was prepared to die for OUR freedom. We need more leaders like Mandela. Tata, thank you, and see you in heaven. I WILL remember what you taught us, and I WILL live it. 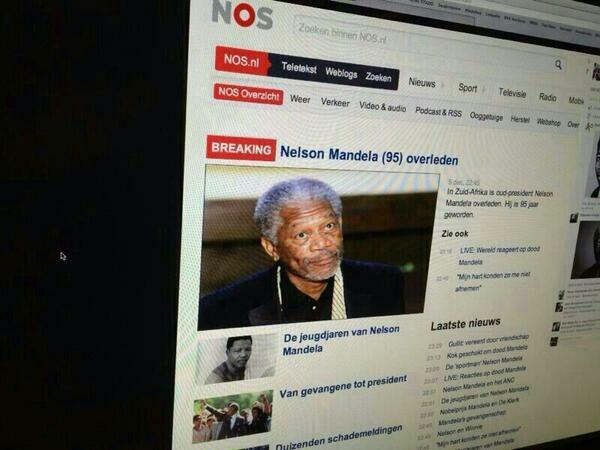 No, it’s not a hoax, yes, that’s Morgan Freeman being called Nelson Mandela. If I were Morgan Freeman I’d be honoured, apart from the dead bit. They look nothing alike! Black man with grey hair, that’s as far as I come. Yes, Morgan Freeman played Mandela in Invictus. Because they look nothing alike, I spent the whole movie mentally filling in Madiba’s face every time Morgan Freeman was on screen. after YEARS in mental health care, I can positively say this is the ONLY thing that actually made a difference. Talking was talking, and essentially forcing me out of my shell OR ELSE THEY WON’T HELP ME at some point was a very harsh and unnecessary way to teach me to actually talk. (Ironically, I had always mentioned that this was very hard for me, but nobody actually cared to help me learn to talk…). Once I learned to talk, I learned that I’d been wasting my time. Ok, I did get proper treatment for my depression the first time round. Unfortunately, I’ve had too many side effects on all 3 antidepressants I tried. I am now terrified of starting a new one. Every time a therapist really ‘got’ me, something happened and I was forced to switch therapists, to somebody who doesn’t get me. And then I was 25, and decided I wanted to be tested for ADHD because I sort of already knew I had it. (I mean, I had a ‘wiggle ball’ instead of a chair at uni!). At first I thought I’d be OK with some training. They insisted I try meds. A year and a bit on, and Concerta turns out to be the most enabling thing the entire mental health service (10 year anniversary this year!) gave me. And I’m sure Concerta alone is a lot cheaper than those 10 years worth of (mostly preventable!) mental health care. Without any real side effects, mind you. My blood pressure normalised by now, and my heart rate is just a bit faster than it would otherwise be. And then I turned out to live in Holland, and because I need it, I am not eligible to get it covered. And I won’t be able to afford it once I start training. (You know, to help Dutch people better…). And I am panicking. I just got turned down by an insurance. And scenarios in my head aren’t funny any more. WHAT IF I CAN’T GET IT COVERED???? So much for living in a first world country with ‘available health care’. I feel like I should move back to the third world country I came from, better health care there. I don’t know how I’m going to do this training without Concerta. I doubt I’m going to cope on Ritalin, as a chance of rebound every 3.5h really can be dangerous if you’re a doctor working with patients. And I’m terrified I might burn myself out again if I’m off meds.